2 Days went way to fast. 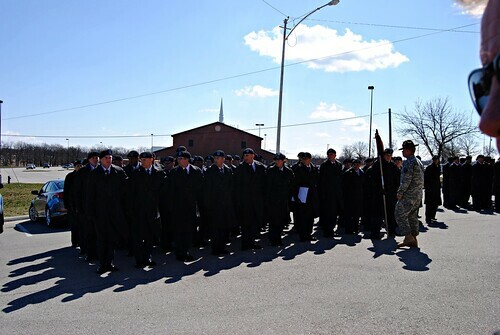 Warning: Picture Heavy Post, what do you expect it is BCT graduation recap. After a long trip that seemed to last forever, I-44 doesn’t have much to see. 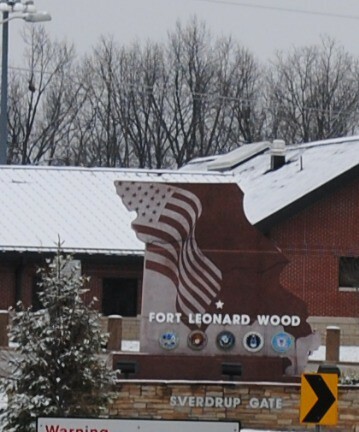 We finally arrived to Fort Leonard Wood knowing we would see C the next morning. As we hit Tulsa, Ian’s foot fell asleep and he paniked that it was broke. 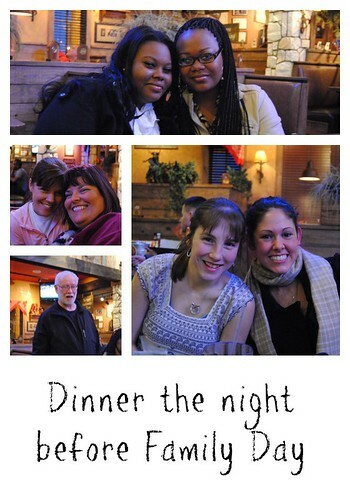 Luckily I had a dinner with some girls I had met on Facebook, the evening before Family day to help keep my mind occupied. All I could think about was seeing C the next day. As I laid down on Tuesday night, I thought I would never fall asleep. I was on the same post as my husband. We woke up the next morning and we got ready and then my Daddy decided that I should go get C by myself and surprise the boys. I was so lucky that a friend was willing to let me ride with her over to the theater (which was a last minute change from the orignal location). We got there and thought they would never let us in. Turns out they were having graduation rehearsal on the other side of the door. When we entered they were all seated and stiff, I just wanted to run over and give him a hug but in all honesty I couldn’t have picked him out of the crowd. Briefing went on for seemed like forever, in reality it couldn’t have been more then 30-45 mins. Then they filed outside into formation where they were put through the paces. Longest wait ever, worse then being a kid on christmas. As soon as they were released it was a sea of soliders, I thought I would never find him until he almost tackled me. 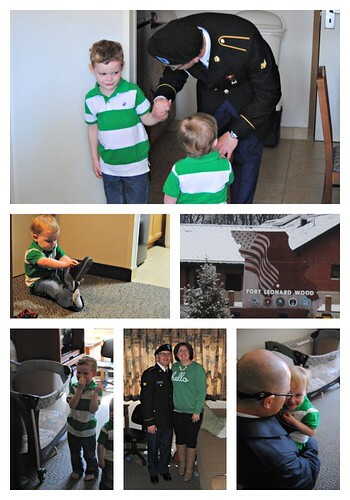 Then it was time to head back and let the boys see their Daddy. 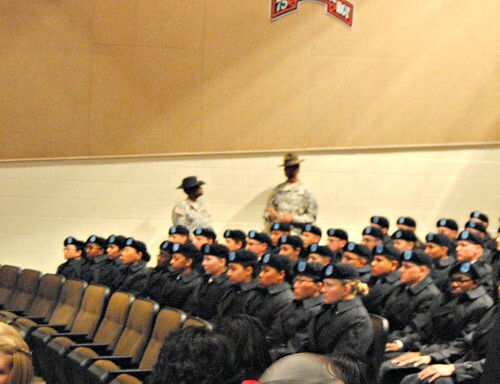 I walked in before C and told them that the Army didn’t give Daddy back. That didn’t even really sink in, they were even more confused by the strange guy that was coming in the door. 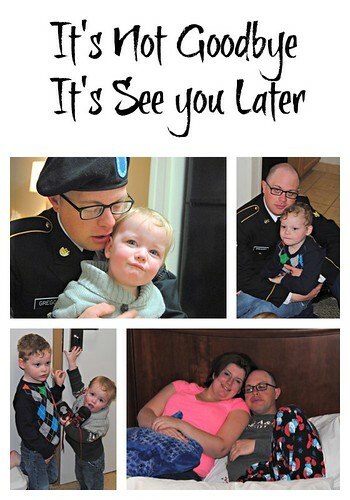 The day seemed to fly by and it was time to take him back to the barracks, knowing I was going to see him the next day made it a little easier to let him go. 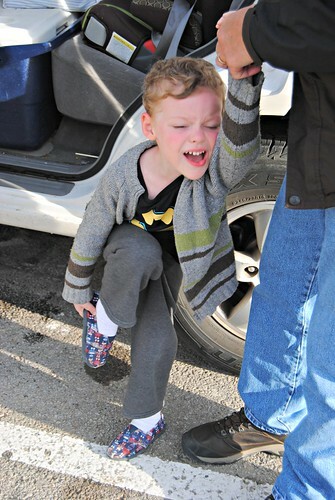 The next morning as we arrived at the theater and the line snaked it’s way to our car at the back of the lot, my Daddy decide to take the boys back to the room. It was a good idea, they would have never made it through with out throwing a fit. I don’t think time has ever moved so fast, the next thing we new it was 8 pm time to give him back. Not a one of us was happy about it, poor Ollie kept following him around crying out no Daddy. So as we headed back to the barracks, I was crying. I didn’t want to give him back. Luckily Samantha was kind enough to take a picture of us in the snow. 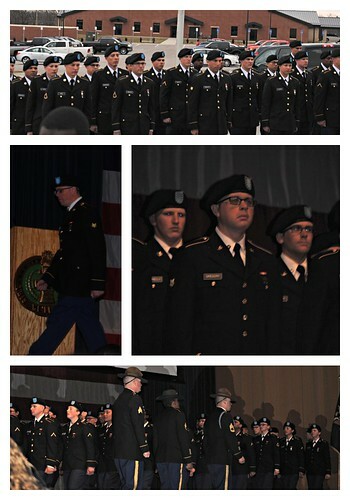 So here we are a few weeks into AIT, I want him home. Really I want to know where our new home will be. We are on this adventure together as a family, as long as we stay on the same team we can handle this. 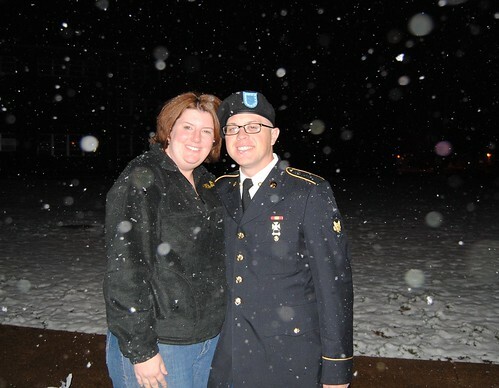 This entry was posted in Army LIfe and tagged army, BCT Grad, Fort Leonard Wood. Bookmark the permalink.